David Ratcliffe has produced an excellent reference book for modellers of the rail blue and sectorisation periods. 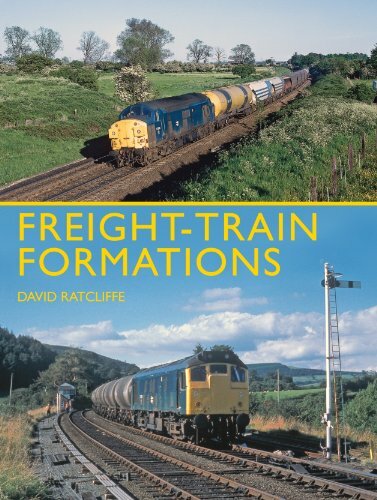 Freight Train Formations is a well produced volume detailing trains from the mid 1970’s up to the early 1990’s. There are lots of good colour photos, many of which are previously unpublished, to accompany the text. The chapters give details of selected formations in great detail, and there is also a list of the various vehicle TOPS wagon codes, which many will find extremely useful. The book has great appeal to the modeller and also to anyone seriously interested in the former freight scene. Long gone loco’s and infrastructure abound in the pictures. Well worth buying. From the dawn of the railway age, the shipment of freight was one of the cornerstones of the railway industry; indeed, it was freight traffic that was the initial spur to the construction of many of the earliest route and passenger traffic was very much a secondary business. It is only in the relatively recent past that freight has been overshadowed by the passenger business. Freight traffic could, however, come in a variety of forms, not all of which could be safely operated together and, for this reason, freight trains had to be carefully organised and rostered. Certain types of traffic – most notably the nuclear flask trains – were designed to operate alone whilst others, such as the final attempt at wagonload freight – Speedlink – could result in a great variety of wagons and goods within a single train. Covering the operation of freight trains since the end of main-line steam in 1968 Freight-Train Formations in Colour for the Modeller and Historian is a largely pictorial examination of the considerable variety of traffic and the vast array of different types of wagon – including both air- and vacuum-braked – that have been utilised by the railways over the past 40 years. The book includes a brief introductory chapter allied to c160 colour illustrations with detailed captions, presenting a selection of workings in detail, including wagonload freights, local trip and Speedlink services, as well as company trains, inter-modal workings and departmental services. All the information on formations is drawn from the British Rail TOPS system to ensure a fully accurate record of the services illustrated.